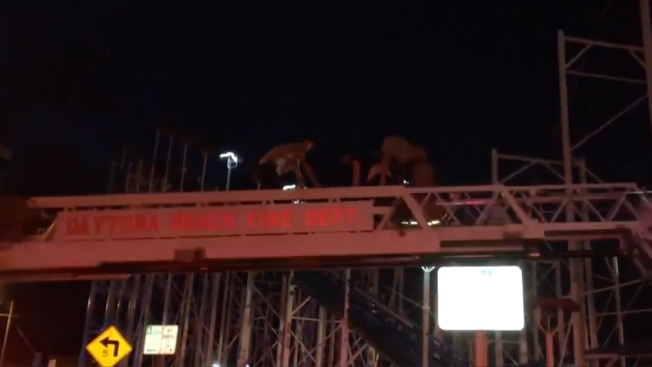 Two roller coaster riders fell 34 feet (10 meters) when their car derailed and was left dangling from the track, and firefighters used ladders to pull eight others to safety high above the Daytona Beach Boardwalk. "The front car which was holding four passengers completely came off the tracks," said Daytona Beach Fire spokeswoman Sasha Staton. Two of the four fell from the Sand Blaster ride Thursday night and suffered traumatic injuries, while "the other two were still in the car dangling," she said. Fire department photos show the red car hanging at an odd, perpendicular angle, with another car jammed behind it. Update: 10 riders rescued. 6 taken to hospital. In videos posted on social media by witnesses, two people can be seen dangling from the car's seats and metal scaffolding beneath the track. Bystanders gathered under the passengers, stretching out their hands to assure them that help was coming. "Two people done fell out and clanked their head on the ground," one witness said in one of the videos posted by WKMG-TV . Firefighters climbed up to rescue them as well as six other passengers in two cars that were still on the track. "They had to use the tower ladder to get to them and then bring them on board and guide them safely back down," Staton said. Six of the 10 passengers were taken to the hospital. Staton said she did not know the extent of their injuries. "We don't know what happened," Staton said. The ride had passed a state inspection just hours before the derailment, according to a statement Friday from Florida Department of Agriculture and Consumer Services spokeswoman Jennifer Meale. "Department inspectors conducted a thorough inspection of the ride, and it was found in compliance with state law," Meale said. Meale added that "anyone who should be held accountable will be held accountable." Roller coaster databases show the Sand Blaster had operated in four other locations in its four-decade history. The ride opened at the Daytona Beach Boardwalk in 2013. Before that, it was at the Blue Diamond Amusement Park in New Castle, Delaware, where the ride was called the Blue Diamond Streak. The coaster operated at DelGrosso's Amusement Park in Tipton, Pennsylvania, and before that, the coaster was at Legend City in Phoenix, Arizona. It originated at Adventureland Park in Addison, Illinois, according to Ultimate Rollercoaster.com. Trevor Gutierrez, a 13-year-old from Atlanta whose family vacations in Daytona Beach every year, told the newspaper that it had been one of the few roller coasters he was willing to ride. But the ride seemed too bumpy the last time he tried it, and after Thursday night's derailment, he decided to never try it again. "I feel like the ride wasn't checked well enough," he said. "I'm not riding on that thing again."